Home › Ask the Vet › Canine Bloat: Is Your Dog at Risk? Canine Bloat: Is Your Dog at Risk? Congratulations on your new puppy! 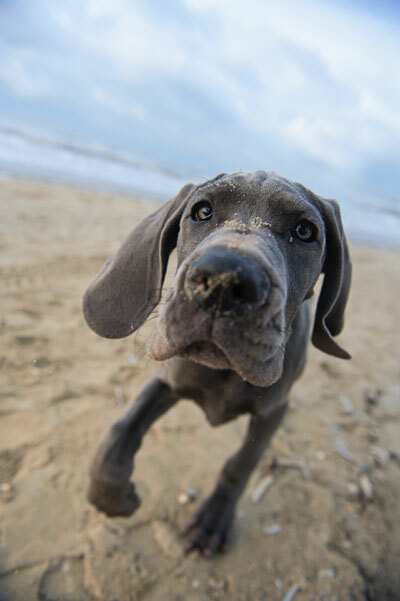 It sounds like you’re performing your due diligence when it comes to preventing bloat, a very common medical condition in Great Danes (and many deep-chested breeds of dog). Also known as gastric dilatation-volvulus or GDV, this serious, potentially life-threatening GI disease in dogs requires immediate veterinary attention and even then has a high mortality rate. Because of genetics, diet, exercise and other factors, certain dogs are predisposed to gas build-up in the stomach which sometimes then twists, completely blocking anything going in or out as well as the area’s blood supply. I’m sure you’ve got the signs memorized: vomiting or retching, drooling, lethargy or the opposite, restlessness, abdominal pain or swelling. • Ironically, a raised bowl or feeder! So there are some things you can do to prevent bloat—feed small meals frequently in a bowl specifically designed to slow consumption—and some things you can’t do—change her conformation or the medical history of her brothers and sisters. Depending on her lifetime risk, you may want to have a conversation with your veterinarian about “prophylactic gastropexy,” or, tacking her stomach to her body wall now before she has an incident. The main thing is slowly eating and drinking small amounts at a time and not exercising too quickly after a meal. And enjoying your new puppy! If bloat occurs, is it something that happens rapidly, in a matter of minutes or hours, or more over time, months with symptoms accumulating? Thanks.